Litografi fra Another Rainbows berømte serie. Stort format, signeret af Barks, nr. 343/350 i regular edition, udsendt 1991. Carl Barks: "The Stone That Turns All Metal Gold", signeret og nummereret litografi. Perfekt stand.Meget berømt motiv af Carl Barks - byggende på en historie fra 1955, "The Fabulous Philosopher's Stone".Litografiet er i den velkendte tårnhøje kvalitet, trykt med silketryk på Opalesque papir.Udsendt af Another Rainbow 1991. Nr. 343/350 i regular edition udgaven. Foto viser et tilsvarende tryk, men med andet nummer.Personligt signeret af Carl Barks. Ægthedsbevis medfølger.Mål: 54,5 cm x 63,5 cm. English presentation by the original publisher: Carl Barks' legendary 1955 comic book story, "The Fabulous Philosopher's Stone," tells of the fantasticatillionaire, Uncle Scrooge Me Duck, who researches a myth in ancient books of bygone pagan kings and an alchemist who fused four metals into a ball of mother-of-gold, thereby making a true Philosopher's Stone that - by touch - turns all base metals into pure gold! The lure of such an unlimited source of gold tempts Scrooge to try to find the Stone. Nephews Donald Duck and Huey, Dewey and Louie assist their miserly old Uncle in a quest or riches that takes them from the Black Forest of Germany to the Mideast and finally into the labyrinth of the bestial Minotaur on the island of Crete, where they find the famous Stone in the throne room of fabled King Minos. The exact moment of their discovery is captured in The Stone That Turns All Metals Gold, an oil painting finished by the Old Duck Man in his 90th year. 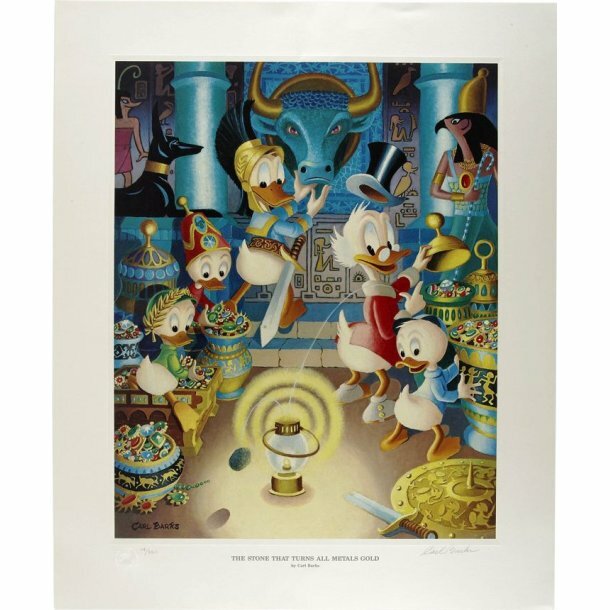 The Stone That Turns All Metals Gold is the seventeenth Walt Disney oil painting by Barks to be reproduced in the continuing full-size, limited edition lithograph series. Printed by the Black Box in Chicago, in an image measuring 20" x 16" on 25 ½” x 21" paper, it is available in a Regular Edition of 350 copies, 100 Gold Plates, five (5) boxed sets of Progressive Proofs, and a special 90th birthday "Friends of the Ducks" edition of 50 prints. 395 have been set aside exclusively for foreign editions, plus two boxed sets of Progressives.